GM Ashley looks ahead to U.S. Championship! On the heels of his recent 2nd place finish at the Foxwoods Open, GM Maurice Ashley has his sights set on the U.S. Championship, America's most prestigious tournament. While the cliché has become quite common, GM Ashley becomes the first player of African descent to compete in this tournament. In an interview with co-organizer Don Colbert, the Brooklyn native spoke of Foxwoods as a "fantastic" event. He stated that it's unfortunate that he can't play all of his tournaments at Foxwoods! GM Ashley was the two-time reigning champion before his 2nd place finish. One of his best games was a well-earned win over U.S. Champion, GM Larry Christiansen. GM Ashley hopes that his success at Foxwoods is a viable stepping stone to the U.S. Championship… one that will bear fruit. Congratulations to GM Ashley for yet another milestone! 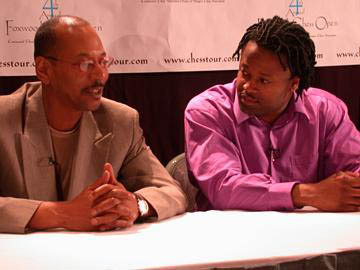 Donald Colbert (left) in a post-tourney interview with GM Maurice Ashley. GM Ashley took joint second and qualified for the 2003 U.S. Championship in Seattle. Photo courtesy of Don Colbert.